British oil giant BP said on Thursday that oil has stopped leaking from the blown-out well in the Gulf of Mexico as a result of the new cap the company placed over the leak. It’s the first time for BP to completely contain the months- long leak triggered by the explosion of BP-leased Deepwater Horizon drilling rig off the Louisiana coast in late April. 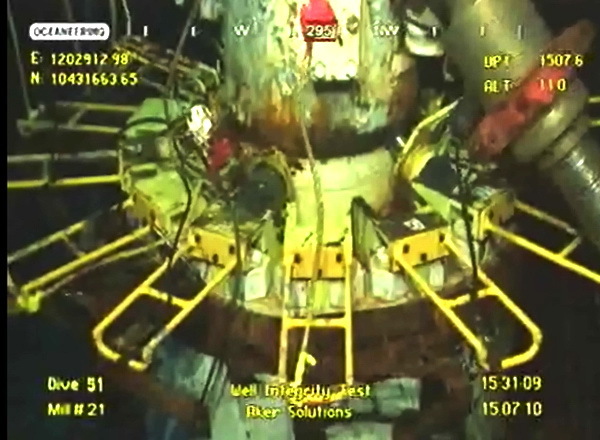 BP’s Vice President Kent Wells said at a news briefing that oil stopped leaking at 2:25 p.m. after engineers gradually dialed down the amount of oil flowing through the last of three openings in the 75-ton metal stack. He said he was “really excited” that no oil was going into the Gulf of Mexico now. Wells made the announcement after BP’s so-called integrity test on the cap to get data including pressure inside the device to make sure no new leaks develop. The company removed the old capping device on Saturday to make way for the installation of the new and larger one. BP had planned to start the test on Tuesday, but postponed it to Wednesday due to an “overabundance of caution” about the effect the pressure could have on the leaking well.